Wow how time flies when you’re on holidays. I took four weeks off due to wanting to watch the World Cup in Brasil. The matches have been interesting and the shocks of teams dropping out are made for good watching. 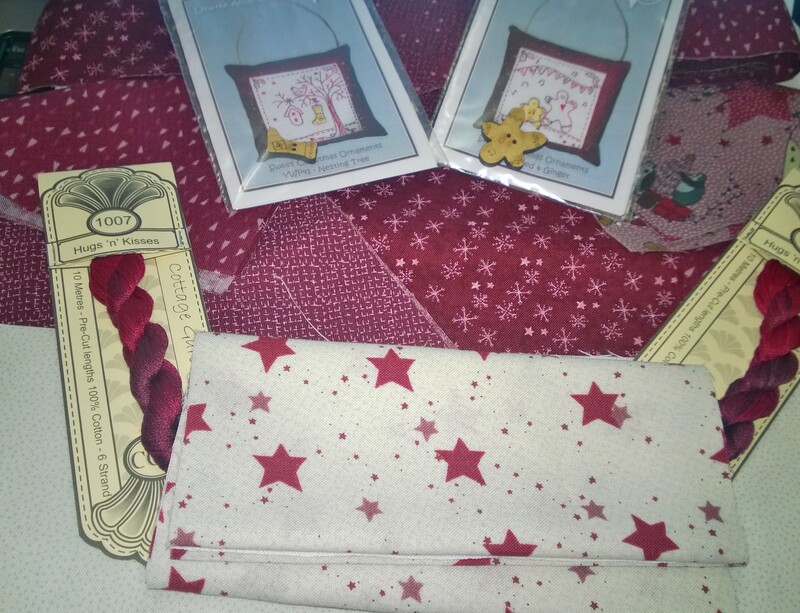 Plus while watching the World Cup I’ve had a good reason to try to complete some quilts. 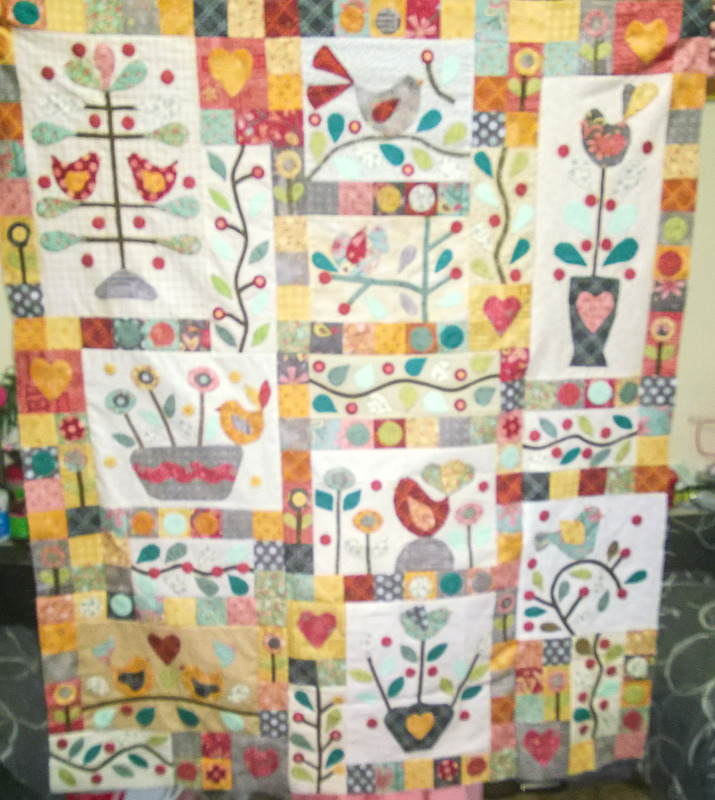 I have just completed all the blocks for Berries and Bluebirds and I am slowly (no true words have been said) doing the boards. I have one border done and I need to now cut and sew on this border. I’m very happy with the way it turned out. I actually even got to show Gail Pan and I think she was very happy. As it is that time of the year to do Christmas celebrations, I attended Christmas in July run in Albury with Gail Pan by the Christmas Beetle. 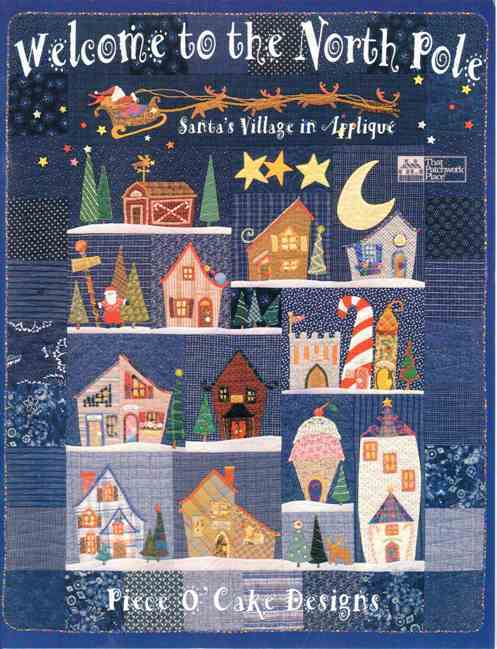 We were given to items to complete – one a stitchery and the other was an appliqué – all with at Christmas theme. 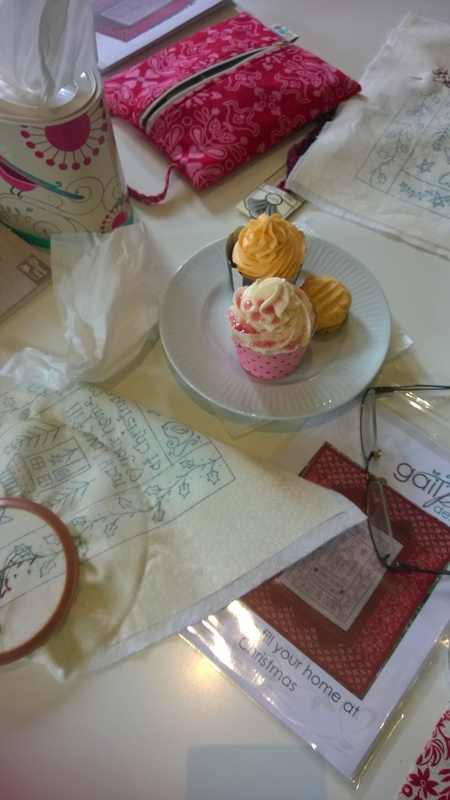 On the Friday, Gail put on a trunk show where we got to see her new fabric range and the story behind it. Oh the range was so lovely. I also brought her new book and had it signed. Hmmm….which designs to do first I wonder. Michele (from The Christmas Beetle) out did herself again. 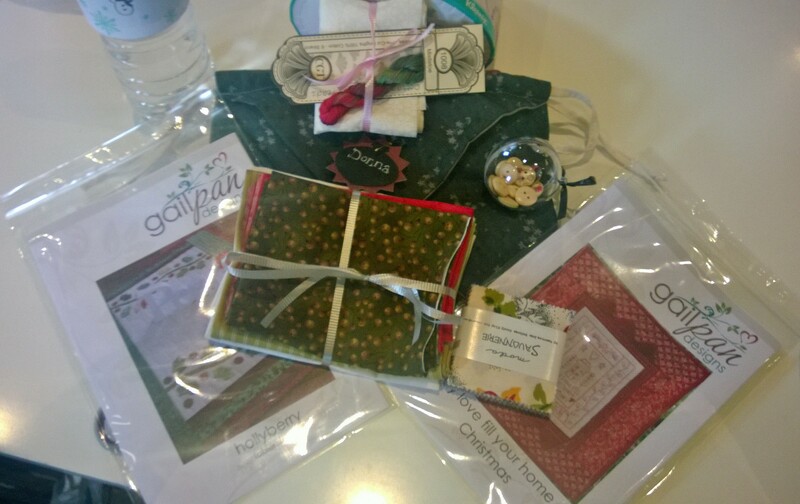 We all received a lovely made bag containing lots of goods in it – scissors, buttons, cotton thread, and a mini candy by moda. We had lovely soup for lunch and the sweets were delightful. I did have to control myself with spending too much money on fabric. • Use a sliding sheet on your machine as it assist with the gliding of the fabric. • Don’t pull the fabric – let it glide on your glide sheet. This reduces breaking needles. 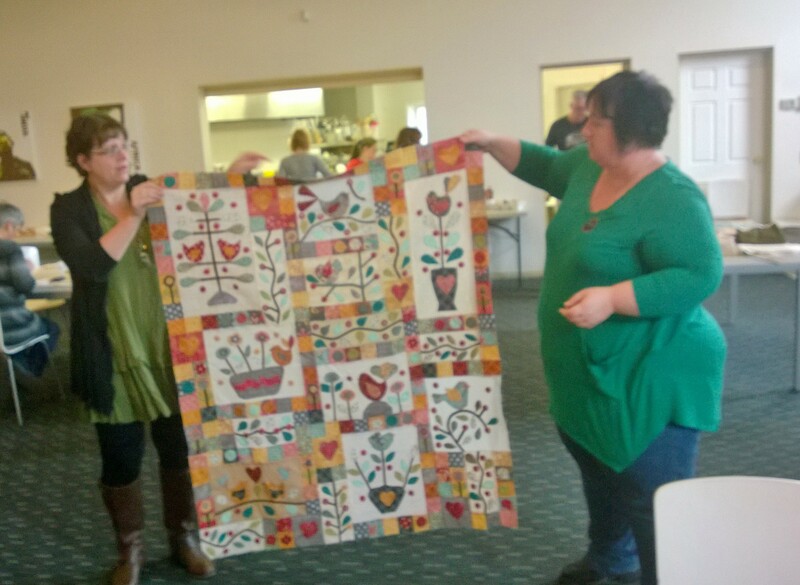 The end result was an almost finished quilt – just a few more rows to complete. 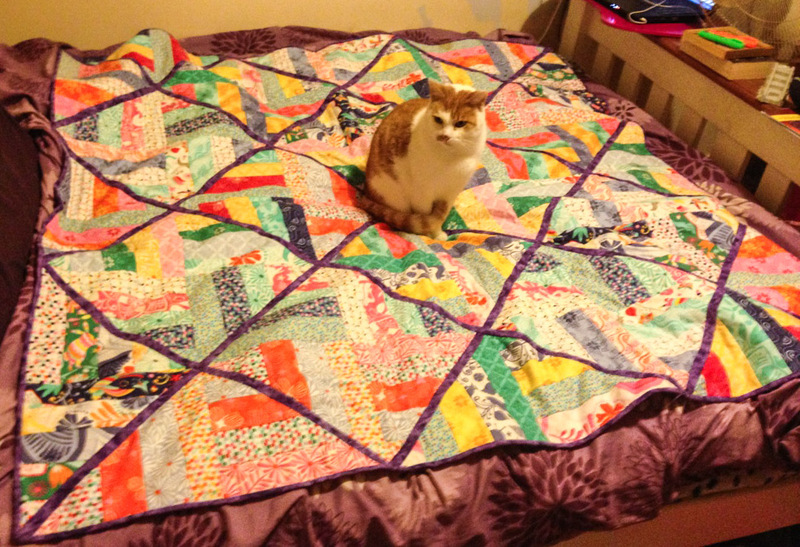 Then add the binding and one quilt finished. 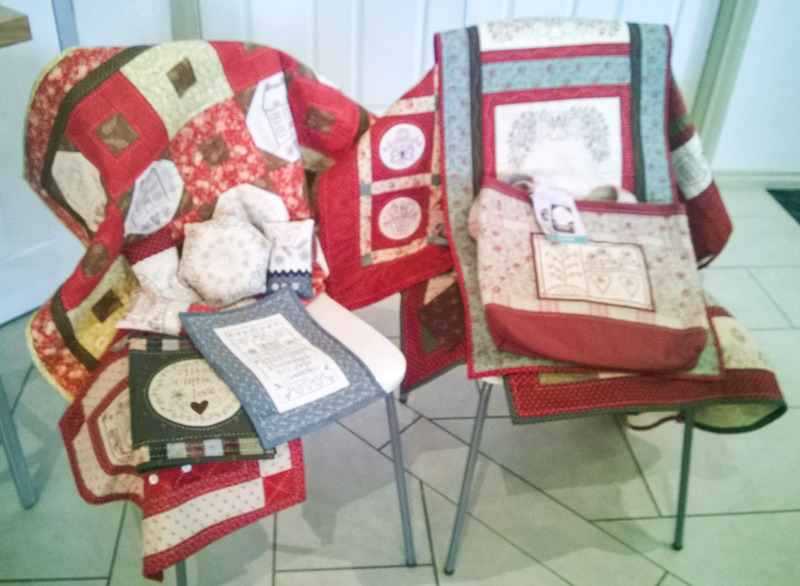 My aim for over this period was to have 2 quilts completed and I have almost done it. I have completed my daughter’s blanket and now need to complete my son’s. 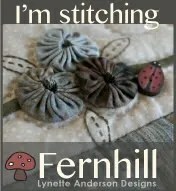 Oh have you seen Lynette Anderson’s new design Sweet Christmas Ornament. It is twelve Christmas ornaments but you can make them into a wall hanging. I’ve decided to do the wall hanging. It looks like a very quick little design done in red thread. Maybe it will be completed by Christmas. This entry was posted in Berries and Bluebirds, BOM, Christmas Quilt, Free motion quilting, Gail Pan, Lynette Anderson, Sweet Christmas Ornament, The Christmas Beetle and tagged Berries and Bluebirds, BOM, Craft Alive, Craft Weekend, free motion quilting, Gail Pan, Gail Pan Designs, Lynette Anderson, Tbe Christmas Beetle. Bookmark the permalink. 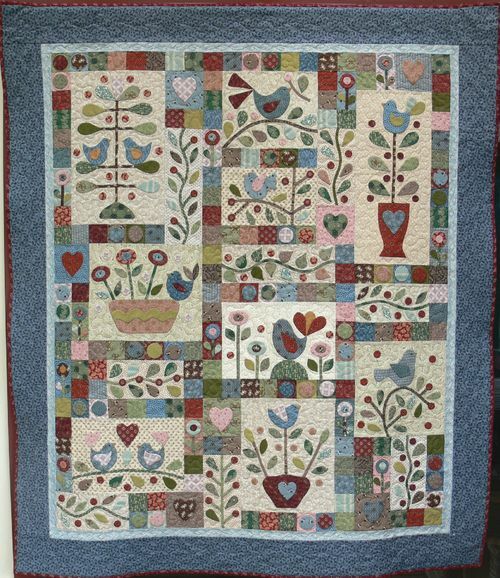 A very nice folk art style quilt. You did good!